The government has rejected the advice of its own elections watchdog and will close down existing electoral registers a year earlier than planned. The transition to a new individual voter registration system will now be completed in December this year. The government says the move will help it redraw constituency boundaries. But the Electoral Commission said up to 1.9m people could lose their vote and Labour accused ministers of "rigging" the boundary review in their favour. Under the new system, people must register to vote individually rather than being listed on a form filled in by one member of a household. To ease the transition to the new system, nobody has been taken off existing electoral registers. But anyone who has not individually registered by 1 December will be removed. In a statement, constitution minister John Penrose said voters had been reminded to register "at least nine times by letter" and the government would be giving local authorities an extra £3m to aid their registration efforts. Mr Penrose said he wanted the new system in place in time for May's elections in Scotland, Wales and English local authorities and allowing people to remain on the old electoral register beyond December would "pose an unacceptable risk to the accuracy of the register". Keeping the old register going "risks having an unknown number of redundant entries on the registers, which would distort the results of the Boundary Review, increase the risk of electoral fraud, and potentially compromise the integrity of those elections," he added. A Cabinet Office spokesman said the move to individual registration had been a "huge success". "Now we need to complete the transition and remove up to two million entries on the electoral registers which are inaccurate or out of date," he added, saying it would "ensure that constituency boundaries, which will be reviewed from next year, are based on the most accurate possible registers". The government is planning to redraw constituency boundaries to reduce the number of MPs from 650 to 600 and ensure they have a roughly similar number of voters. But Labour, which gains an electoral advantage from the current boundaries, has accused the government of trying to remove millions of its voters from the register. Shadow Justice Secretary Lord Falconer said the decision to bring forward the end of the transition to individual registration was "yet another example of how David Cameron's government is intent on rigging the game in its favour". "The Tories are ignoring the Electoral Commission's recommendation not to proceed in December 2015 - a decision which risks depriving millions of people of a vote as they fall off the electoral register. "This looks like a partisan decision intended to help the Tories push through a boundary review rigged in their favour." The Electoral Commission chairman Jenny Watson said the implementation of the new registration system "has gone well so far". But she added: "Taking into account the data and evidence which is available to us at this point, and the scale and importance of the polls scheduled for next May, we still recommend that the end of transition should take place in December 2016 as set out in law". She said it should be up to MPs to decide when the transition to individual registration should end. Katie Ghose, chief executive of the Electoral Reform Society, said: "There are nearly two million people left on the old register who are at risk of being completely excluded if the government refuses to give enough time to transfer to the new register. Private renters and young people - who move around most - could be most at risk. "Holes in the register of this scale are not good news for the boundary-drawing exercise, especially when the completeness of the register is such an important issue." She described the decision as a "travesty for democracy" and called for a "revolution" in voter registration to make it "as easy as voting itself". 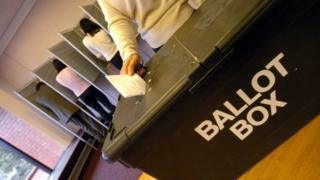 But John Turner, chief Executive of the Association of Electoral Administrators, backed the government's decision. He said: "It is crucial to have the most accurate register possible and have confidence that everyone on the register is who they say they are. For those reasons, the Association of Electoral Administrators supports the transition to Individual Electoral Registration ending in 2015." MPs could opt to hold a vote on the government's new plan, otherwise it will automatically become law.